Super light and beautiful too! Perfect size for me because I am only 5 feet 3 inches tall. The best fit out of soooo many I tried. Smooth ride and very easy to ride. This is a nice retro looking bike. It would be nice for around town riding over riding a scooter. I will have to check out the specs online. Enjoy your new ride. SYM is a 59 year old company based originally in Taiwan, so unlike the johnny-come-lately el cheapo Mainland China crap, they're far above them in quality. Every major magazine road test has given this model high marks for quality, fit & finish. It's good to see someone find a nice, light little standard to learn on...so many women who are inseam-challenged think they're only choice is an overly heavy, cumbersome Cruiser style bike..it's sad. There are many Standards and Sport-Standard smaller bikes out there that make the learning process SO much better and comfortable. I'm glad for you, enjoy your little bike. 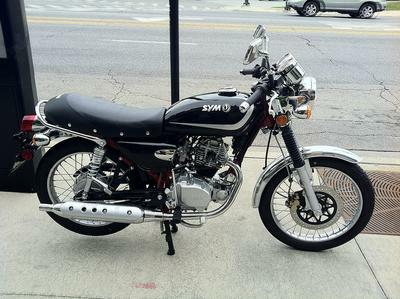 Along with my other bikes, I have a vintage ('75) RD125 I take out now & then just for fun, on rides up to about 60 miles R/T.